Pet Lovers: Beware of Online Dog and Cat Adoption Scams! You are here: Home / Articles / Articles / Article Box Left / Pet Lovers: Beware of Online Dog and Cat Adoption Scams! Adopting a pet is a special event shared between humans and their animal friends. However, you must be aware of the dangers of being scammed. When a person sends money for a pet across the internet, if it was an adoption scam, they may have little to no legal options for recourse, as the scammer will likely disappear without a trace. Save yourself time, money and heartache by being extremely careful when deciding to adopt a pet online. Sadly, there are con artists that prey on eager, trusting, and compassionate people. Yes, there are many trustworthy sites as well, but it is worth your while to do your homework so that you are not conned out of money in addition to never receiving your new pet, or else receiving someone else’s stolen pet. Free or discounted purebred puppy or kitten. There is a reason purebred dogs are expensive, and it is because the puppies are nurtured from birth with extensive health, socialization, temperament, and structural treatments. Some breeds have inherited diseases, as well, so qualified breeders go through painstaking efforts to maintain the breed standards. If money is an issue, just know that adopting a grateful dog from the shelter can be a truly positive and life-changing experience, and it is absolutely worthwhile. Purchasing an animal online to be a pet is different from heading over to the Onlinestore.com and picking out some curtains. Besides, how can you be sure that the animal even exists? Sadly, a common scam is to require the adoption payment upfront and then to never send the animal. Instead they only continue coming up with more reasons for the poor scammed individual to keep giving them more money. Save yourself the headache and go meet the animal you want to bring into your life. Animals have unique personalities like people, so it is worthwhile to find one that you can mesh with. Sure, many of these are legit, but unless you intend to fly or drive there to meet the pet, you will have a difficult time proving that there is indeed really the animal there waiting for you to adopt it. Sadly, some scams can seem very authentic, and many of these cruel con artists really know how to tug on the heart strings of innocent people. If you can find a local seller, or better yet, adopt from a local shelter, it would be a smart move. Search online about the seller. Read reviews! If you aren’t able to find much on the seller, then chances are that they are a scam with no fur baby to give you, just a cute picture and a lot of lies to trick you into sending money. These methods work the same as sending cash. Once money is sent this way, it is gone for good. Never send money to someone you do not personally know and trust. 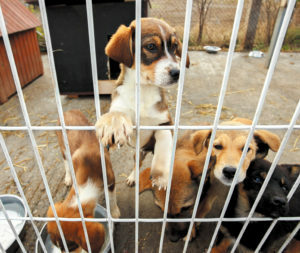 Offering animals for free can be suspect, due to no real screening for potentially dangerous adopters, and ads that offer free pets could be dangerous to people interested in adopting pets. Scammers like to draw people so that they can only request the “shipping cost” for the nonexistent animal. If they try to rush you and say they need to get rid of the animal for some reason, they are probably more in a rush to scam you than anything else. If they seem to have broken english, misspelled words, or bad grammar, then that is also a red flag. This alone, of course, doesn’t necessarily mean that the sellers are scammers, but if anything else seems fishy, you might want to rethink giving them anymore of your time or money. https://cdn.askthelawyers.com/wp-content/uploads/2018/01/28091807/Dog-at-Kennel.jpeg 2451 2903 AskTheLawyers™ https://www.askthelawyers.com/wp-content/uploads/2018/05/Asset-2-300x40.png AskTheLawyers™2018-01-19 12:08:012018-01-31 14:42:03Pet Lovers: Beware of Online Dog and Cat Adoption Scams!